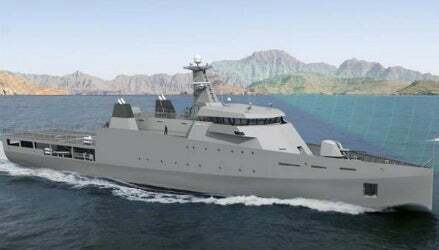 The second generation Damen OPV 2600 offshore patrol vessel has a length of 103m. Image: courtesy of Damen Shipyards Group. The new Damen OPV 2600 features a long and slender Sea Axe bow hull. Image: courtesy of Damen Shipyards Group. The second generation OPV 2600 can carry two 9m-long rigid-hulled inflatable boats. Image: courtesy of Damen Shipyards Group. Maximum speed of the OPV 2600 is 26kt. Image: courtesy of Damen Shipyards Group. OPV 2600 is the longest of four new second generation offshore patrol vessels designed by Damen Shipyards to support a wide variety of missions conducted by naval forces and coastguards. The vessel is ideal for anti-mining warfare, search and rescue, border security, exclusive economic zone (EEZ) surveillance, humanitarian aid, fishery inspection, and oil spill recovery tasks. It can also be deployed to combat piracy, terrorism, and drugs. The other three newly-designed second generation offshore patrol vessels are OPV 1400, OPV 1800, and OPV 2400. Holland Class offshore patrol vessels (OPVs) were built by Damen Schelde Naval Shipbuilding for the Royal Netherlands Navy. The second generation OPV 2600 features an efficient and versatile design. Its long and slender hull with Sea Axe bow provides reduced water resistance, comfortable sailing in stormy sea state conditions, and superior sea-keeping capability at high speeds. The vessel has an overall length of 103m, beam of 14.4m, draught of 4m, and displacement of 2,600t. It is operated by a crew of up to 60 members, while an additional 48 personnel can be carried in the 320m² multi-role compartment. It can carry two 9m-long rigid-hulled inflatable boats (RHIBs) for visual identification of unknown targets around surrounding waters. The boats can be deployed and recovered through a small stern slipway. A quick-connecting hook enables efficient recovery of the boat under sea state conditions up to 6BF. "The standard multi-mission bay is designed to hold different types of equipment required for a variety of missions." The new offshore patrol vessel incorporates three new features including multi-mission bridge, multi-mission helicopter and unmanned aerial vehicle (UAV) hangar, and multi-mission bay. The telescopic hangar houses one NH-90 helicopter, weighing 11t, as well as one UAV such as a Boeing ScanEagle. It has a 25m-long and 14.4m-wide helicopter flight deck with refuelling capability for launch and recovery of the air vehicle. The hangar also features a dedicated UAV workshop, and a helicopter spare parts store and workshop for maintenance. The standard multi-mission bay is designed to hold different types of equipment required for a variety of missions. It stores one of the two RHIBs and accommodates up to five dedicated mission module containers, which can be loaded through the helicopter deck. Two PS and SB hatches located at the stern of the vessel to deploy equipment such as remotely-operated underwater vehicle (ROV) and sonar. "The command and control centre of the new OPV is placed directly next to the standard multi-mission bridge, facilitating easy and fast communication." The command and control (C2) centre of the new OPV is placed directly next to the standard multi-mission bridge, facilitating easy and fast communication. It can be separated from the bridge using a blinded sliding door. Situational awareness in the C2 centre can be improved by lowering the sliding door. The Damen OPV 2600 offshore patrol vessel is fitted with one 76mm main gun and two 20mm secondary guns. Sensors and communication systems aboard the vessel include electro-optical (EO) fire control sensor, X-band and S-band radars, surveillance radar, autopilot, speedlog, F77 communications system, echo sounder, Navtex, Gyro, Satcom C, as well as ultra high-frequency and high-frequency receivers. The base version of the OPV 2600 vessel is powered by four engines, which have a capacity of 2,350kW each. It is also fitted with two 3m controllable-pitch propellers and one bow thruster with a 450kW, E-motor fixed-pitch propeller. The vessel has a maximum speed of 26kt, a range of 7,000nm, and an endurance of 40 days.